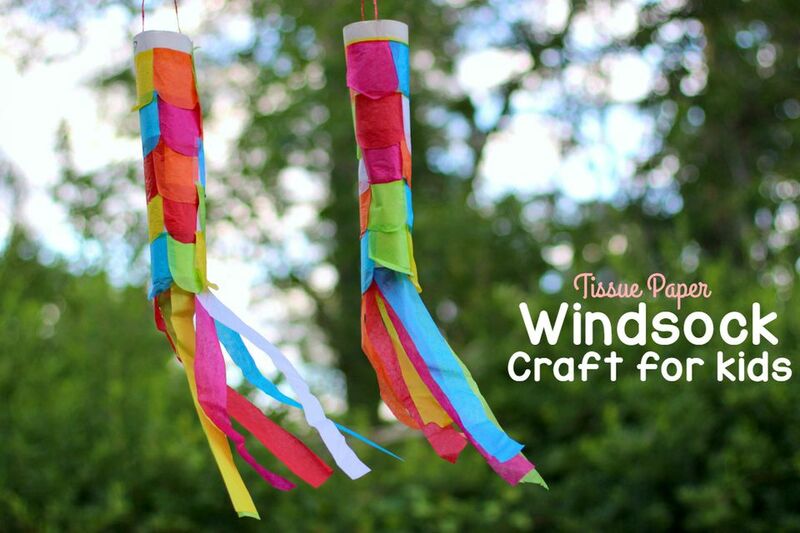 These tissue paper windsocks are a great way to add some color to your patio and let your kids decorate their environment in a fun way! Plus they are also an affordable craft that all your kids can enjoy as tissue paper can be found in several colors at your local dollar store. The first step is to cut your tissue paper into small shapes. These will be what you layer onto your construction paper to make the main portion of your windsock. We cut ours out similar to if we were doing “scales” on a fish craft but you could do any shapes that you want. Cutting is a great fine motor activity for kids. We used a pen to draw lines across the paper for the kids to use as a guide for the glue. We made sure that the lines were close enough together that the tissue paper would overlap the row below it, giving it a layered look. The kids squeezed the glue along the lines and then used a paintbrush to spread out the glue. You can do each of the lines at once or as you go, whatever you prefer. Next, starting at the bottom, let the kids add tissue paper in any patterns or designs of their choice. When each line is covered with tissue paper, set aside and let dry. If you spread the glue out with a paintbrush, rather than just squeezing out a line of glue, it dries faster. While we waited for ours to dry we cut long, rectangular strips from tissue paper to be used as the tails of our windsocks. Once it was dry we glued the long sides of the construction paper together creating a “tube” shape. Next, you want to glue your tissue paper strips to the inside of one end of the tube you created, this creates your windsock tails. The last step is to add some string to the other end so that you can hang your creations. You can also use tape for these last steps to avoid having to wait for it to dry again. Hang up and enjoy when done! The look so colorful floating in the wind! Plus, they are so easy that toddlers to early elementary aged kids can do them!